The weather is definitely turning up here on the roof and thoughts turn to preservation. No, not jam (no room or desire to grow anything as useful as fruit) but making sure everything is given the best chance to make it through the winter. The arilbred and juno Irises received a dusting of sulphur to keep rot at bay because while I have to keep them dry until February, I also have to keep then well aired so a little chemical intervention (sorry organic chums, somethings are too precious for principles) was required. It has certianly given them an interesting appearance! I'm also expecting delivery of a genuine thoroughbred oncocyclus (the orchids of the Iris world) this week and it will need all the help it can get to make it through a wet London winter. Cold is no problem, but water and stagnant air is (they come from Turkey, Jordan, Syria and the various Stans of the former Soviet Union) and it's essential not to break dormancy (ie start it growing) too early and that's what water would do (witness the one front middle that somehow managed to get going despite being covered. I'm nost worried about the Verbascum seedlings which are only a month or so old, and will probably find room for them in my (unheated) polythene greenhouse, it's against a south facing wall and we rarely get frost in central London so they should stop growing but not die, which is the best I can hope for. Strongly rooted cuttings of the Pelargoniums, Penstemons, Salvia and other tender perennials will join the Verbascums, along with the tropical Canna indica (cold+wet=pile of rotten sludge). I've seen it growing like a weed on the banks of the Brahmaputra in Nepal (get me!) but it needs a bit more help here. It's too late to take more buttings of the Dahlias so I'm just going to have to dry them out, sprinkle with the flourescent green sulphur I bought yesterday and tuck them somewhere safe, perhaps buried in dry compost or vermiculite. It's the first year I've grown them so if I lose them I won't be too heartbroken, they are replaceable, although good old Bishop of Lanstaff (below with chum) has been such a do-er this year it seems a little unfair to leave him to the mercy of the elements. Other trays of young seedlings (meconopsis x2, digitalis x2 and primulas) will have be covered with plastic lids and newspaper or bubblewrap at night, depending on the forecast. 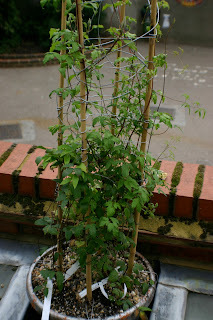 Moving on, I've been trying to make sense of the pruning regime for the clematis tower and think I've got it sussed. As they are container grown they will all need to be cut back to about 18inches or I'll get all the flowers at the top. Clematis alpina (the group to which "Jacqueline du Pre" belongs) shouldn't be pruned at all but as it is due to flower first in the year (although "Niobe" is actually going to beat it in a few days), I'll let Jax do her thing and then cut back hard to just above leaf nodes after flowering. This also gives me the chance to take cuttings and Clematis as very rare in the plant world in this respect: they strike best from inter-nodal cuttings, ie, you cut half-way between two pairs of leaves and insert the bare stem into the rooting medium. It goes against all intuition as the rooting hormones of almost all plants are gathered around the point at which the leaves join the stem, which is why you take cuttings of Pelargoniums or Fuchsias just below a pair of leaves (and then of course remove them so they don't rot). Clematis: a pruning headache unless you know your stuff! But with Clematis its inter-nodal and it works, I've tried it, even though it goes against every instinct as an amateur gardener. With Jacqueline, I may well get a second flush of flower in the autumn, another reason to prune. "Niobe" and "Nelly Moser" bloom in the spring on old growth. These are pruned lightly in late winter or early spring. Start pruning from the top down, removing only dead and damaged stems to the highest pair of healthy buds. After flowering they will get a proper haircut down to a foot or 18 inches. Finally, "Orange Peel" blooms on current growth later in the year so it gets cut back early in the year to give it plently of time to put on flowering growth in late summer. So, in short, because I'm growing in a container, they all get a hard pruning at some point in the year. Each will be accompanied by a good feed and has the benefit of causing the stems to branch more, giving better coverage of my bamboo, steel wire and string obelisk thing which, while a thing of great beauty to me because I made it, is actually a bit of a mess. 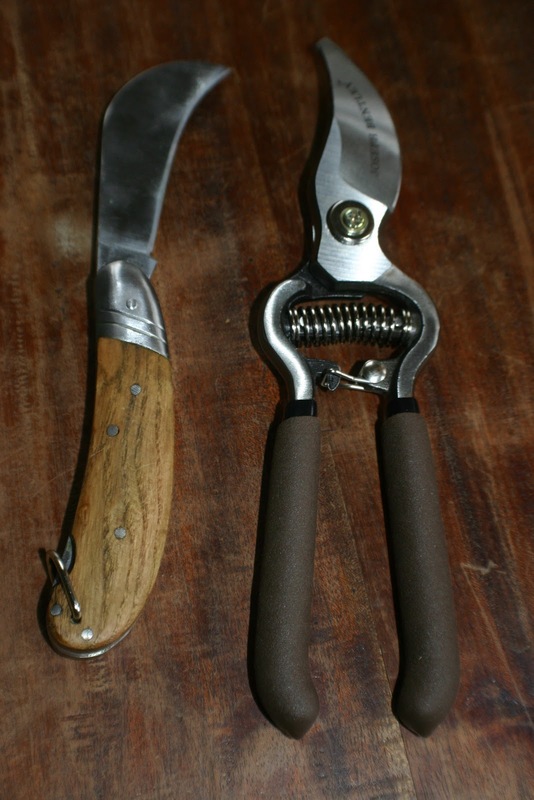 Yesterday I hobbled to the nearby (ie the expensive) garden centre to invest in a new pair of secateurs, which also came with an extremely sharp knife, perfect for preparing cutings. Secateurs are the kind of thing gnarlyed old gardeners buy once and oil and sharpen and care for for life. These cost £20, mid-range, and are extremely good. I just have to remember to keep them indoors, pamper them and not lose them! While there I took pity on a Lobelia cardinalis in the bargain bin (well, it still cost over £6 for a specimen 3ft high and 4in wide). Now, don't be fooled by the name Lobelia, it's not one of those hideous trailing things you see dying in hanging baskets everywhere, it's an upright perennial with dark red foliage and stunning big, scarlet flowers, native to north America. By the time I'd extricated it from its fellows, got in on the bus, popped into Tesco and got it home, all but one of the leading shoots had snapped but that was fine because I'd bought it as a cutting factory anyway. I'm guessing they will take pretty easily, although I might have to start thinking about bottom heat but that means finding somewhere in the house with enough light and sufficiently out of the way to keep the missus happy and that place doesn't exist in this dimension (it does but it's on his desk). They'll just have to get a move on before it gets too cold, I think they'll be pretty easy. Definitely near the end of this year's life-cycle! Ok, that's quite enough for one day, the postman's just delivered my last plant order of the year, the Fritillarias and oncocyclus and reticulata Irises mentioned yesterday so that should keep me busy this afternoon. Thanks for reading, happy gardening and please bookmark me if you like what your read! PS: What phenomenal quality bulbs from Rose Cottage Plants! Perfect in every way, each species bagged in paper with planting and growing instructions. Wish I'd taken a few photos before planting to show you tomorrow but it's beginning to rain so I wanted to get them planted and under cover pronto. I have to say, all the mail order firms I've used this years: Kevock, Thorncroft, Slack Top, Gendoick and the above mentioned, oh and Chiltern Seeds and Cayeux Irises of Spain, have provided product of the very highest quality. Anything that goes wrong with the plants is my fault (or more likely the weather), not the nurseryman!